The pattern is mostly an outline -- the way I think about patterns. It is charted. There are minimal written directions. I didn’t have enough Peaches & Creme beige yarn to work the entire dishcloth and so started and ended with Lily Sugar’n Cream “country brown”. I made the top and bottom borders wider to make the cloth more nearly square. 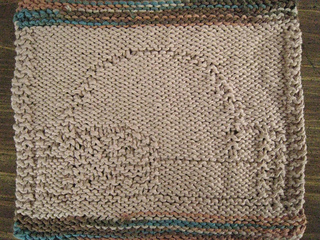 The side borders are a 2-st garter st border. 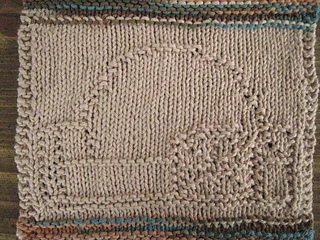 The dishcloth is made from scrap yarn. I used a size 6 needle -- which is one size smaller than the needle I would use for a cable or lace pattern with this type of yarn. I’m not quite happy with the doorway but can’t think of how best to improve it.